Lord Levy denies any "wrong-doing whatsoever"
No 10 aide Ruth Turner was concerned a version of events put to her by Lord Levy was untrue, the BBC has learned in new cash-for-honours developments. Ms Turner was concerned about the Labour fundraiser's account of his role in drawing up the Honours List. The BBC has not seen the document containing her concerns but has been told about it by more than one source. The injunction barring BBC reporting of the story was lifted earlier. 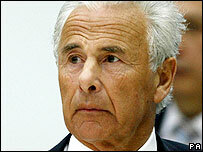 Lord Levy denies "any wrong-doing whatsoever". He also criticised the "prejudiced and distorted" picture presented by recent media reporting. The Attorney General did not contest the lifting of the injunction, which had originally been sought by the police. In the document, one source has told the BBC, Ms Turner, Downing Street's head of government relations, said she was worried by Lord Levy's words and she believed the prime minister should be told about it. The BBC does not know whether the prime minister was told. Lord Levy has always maintained he played no role in drawing up the list of those to be recommended for peerages - although he has accepted he may have given his opinions about individuals who appeared on the list. If the police believe Lord Levy was asking Ms Turner, one of Tony Blair's closest advisers, to alter her evidence this could lead to charges of conspiring to pervert the course of justice. It is possible, however, that Ms Turner misunderstood what was being put to her by Lord Levy and they simply have different memories of the same event. No charges have been brought against anyone in connection with cash-for-honours - none may ever be, and all involved deny any wrongdoing. Neil O'May, from Lord Levy's solicitors Bindman & Partners, said he "categorically denies any wrong-doing whatsoever". He said that the "current round" of media reporting was "partial, contradictory, confused and inaccurate" and could be perceived as a "media-style trial". His statement said: "There has been a regular stream of leaks to the media during this year-long investigation, all of which have presented a prejudiced and distorted view. "Cumulatively, these leaks and reports have created a climate which does not allow for any fair assessment of the investigation. "Any fair-minded person must realise the intolerable burden that is placed on Lord Levy and his family by this media-style trial when Lord Levy is unable to defend himself on these matters whilst the police investigation continues. "Lord Levy respects the importance of maintaining the integrity of the police inquiry and so is unable to comment further at this time." Mr O'May said he had asked the police investigating cash-for-honours allegations to find out where the information reported in the media had been coming from. The cash-for-honours probe began a year ago. Police are investigating allegations that honours were exchanged for loans to the Labour Party. The probe switched its focus recently from the question of cash-for-peerages to allegations of a cover-up.